New Disease Reports (2005) 12, 17. Pathogenicity tests were conducted in the greenhouse by spraying 3-months-old plants of the three different hosts with an aqueous suspension of conidia (1 x 104 per ml). Control plants were treated with distilled water. They were incubated in a moist chamber for 48 h and then maintained at 17 to 22°C. 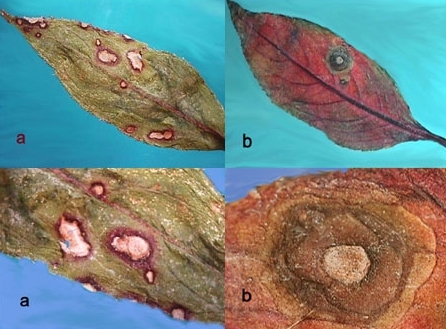 After 40 days, leaf symptoms developed into lesions similar to those produced on naturally infected leaves and the pathogen was again isolated. No symptoms appeared on control plants. To our knowledge, this is the first report of C. apii s. lat. (=C. fukushiana) on I. balsamina in Argentina and the first record of this fungus on Impatiens x hawkeri in the world. Chupp C, 1954. A monograph of the fungus genus Cercospora. Ithaca, New York, USA: C. Chupp. Guo YL, Jiang J, 2000. Studies on Cercospora and allied genera in China I. Mycotaxon 74, 257-266.